The key to successful business requires a clear mindset and focused vision. As you have heard every business failed in its starting days due to unplanned approach. But with the changing world, people do business by capturing the imagination of aspiring businessmen. It doesn’t matter whether you have to come across thrilled customers, balanced profit and many other business aspects. 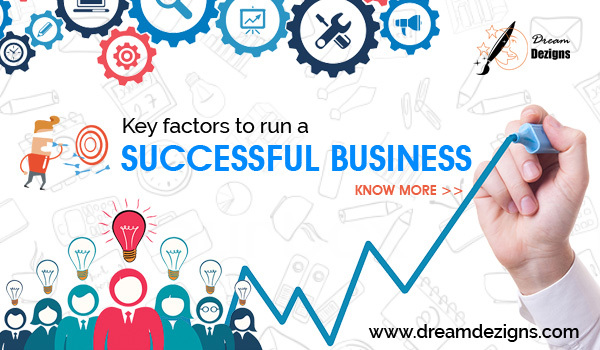 Now, what are the key factors to run a successful business. Browse this post to know about this in detail. Vision – Make your business grow in the market. You need to start your business with clear mindset that what actually your business is going to serve to customer. Your perception is the way you do business. So, it should be clearly demonstrated. Unique Business Idea – For running any business properly, a great is very essential. If you don’t have any unique idea, you can’t do anything. Whether your business sells a new product or service, all it requires is an improvement. You should think like either to solve a problem or satisfy a need. Capital for investment in business – It is one of the important factor to keep your business on track. But sometimes, with huge capital yet still some of the companies failed. Thus, it’s not about having the capital it’s about you should how to properly use to make your business rewarding and wealthy. Effective Team for Implement ideas – A team is required who works in a strategic direction and execution of the program. Your team member should best in their profession whether an accountant, operations manager, product development etc. Perfect Timing – The major factor that destroyed a business is irrational decision making, taking miscalculated risks or making ill-timed business moves. For this, timing should be perfect otherwise, it will cause the loss of value in market and helps competitors. Integrity – Being honest and open about your business helps your company grow and develop your individuality. Moreover, you should be honest with your employees, customers, suppliers, associates, investors, etc. There is no secret key to make your business works. It’s all about your best efforts and practices.